Introducing disarticulated full skeleton with a 3-part skull is by 3B Scientific. This skeleton model is really a great value for the money! Given the fact that it is manufactured by the leading company in the industry of anatomical models and instructional materials used across the globe in the field of medical and scientific education. Aside from that, every other bone in this life-like specimen is unattached which is very helpful for a close-up and in-depth study. 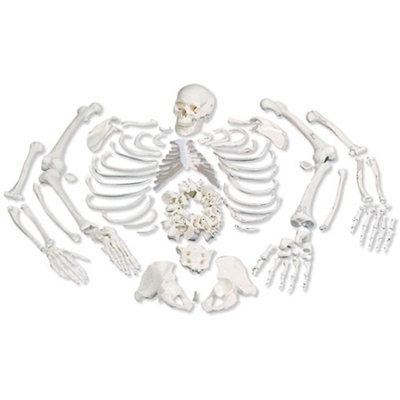 This life-sized skeletal version is perfect for students of anatomy and medical professionals who require a comprehensive study of the human skeletal system. This skeleton replica is a high-quality product from Germany and is made of industry-grade plastic resin that is sure to last for years of study. Most importantly, this product is packed in a tough, sectioned cardboard storage box to keep it safe intact and dust free when not in use. HIGH-GRADE CASTING FROM A HUMAN SKELETON SPECIMEN- If you are looking for an anatomy model with life-like detail, think 3B Scientific. Because with every 3B Scientific models, you can expect uncompromised attention to detail. Not only that, but it is also made from an industrial-grade plastic resin material that lasts for years of study. REALISTIC ADULT-SIZE MODEL- With its full dimension of 48.5 cm x 27 cm x 42.5 cm and weight of approx. 4.8 kg, this will definitely give you a real-life size of a skeleton model. STURDY PARTITIONED STORAGE BOX- Packed in a tough, sectioned cardboard storage box keeping it safe and dust free when not in used. 3B SCIENTIFIC® PRODUCT MADE IN GERMANY- This product is manufactured by 3B Scientific in Germany. A globally recognized brand standing for quality, durability, and detail, 3B Scientific is one of the premier anatomical model manufacturers we carry at ShopAnatomical. FUNCTIONAL/EDUCATIONAL-It features one hand and foot mounted on wire, one hand and foot set loosely unattached and every other bone of this model is unattached for a close-up and depth study. I purchased 10 disarticulated full skeltons. While the skeltons are of a very fine quality, the product description indicated the product came with a "sturdy" storage case. Our products were shipped in the "sturdy" storage cases. Needless to say after being shipped the "sturdy" storage cases were no longer sturdy. When contacted about the issue customer service indiacted no fix was available.